Halloween is a perfect time to learn more about the fascinating ancient art of making mummies. 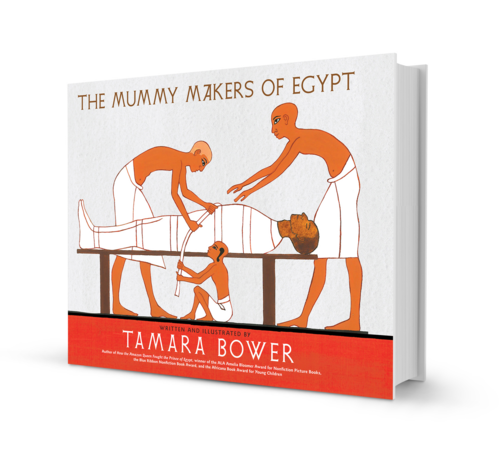 Tamara Bower, author and illustrator of The Mummy Makers of Egypt, appears at Bank Street Book Store on Sunday, October 30 at 2:00 p.m. to share techniques and facts about ancient embalming. Tamara might even ask for a volunteer or two from the audience to get wrapped and "mummied." Join us for an interesting -- and fun -- prelude to Halloween costumes and trick-or-treating. Using the classic style of Egyptian art, the The Mummy Makers of Egypt is painstakingly accurate in facts and illustrative style. Artifacts, funerary customs, kid-loving gory details of the mummification process, hieroglyphs, and details of life in ancient Egypt are told through the eyes of Ipy, whose father is embalmer to the King. Yuya, father of the Queen, has died and Ipy must help his father in the mummification process. Yuya is an actual mummy and the discovery of his tomb is an entertaining story in itself, with the archaeologist Theodore Davis fainting at the sight of so much gold, and the portly Gaston Maspero getting stuck while trying to climb into the tomb. Yuya's tomb was a spectacular discovery in the Valley of the Kings that was later overshadowed only by the discovery of King Tut, Yuya's great-grandson.